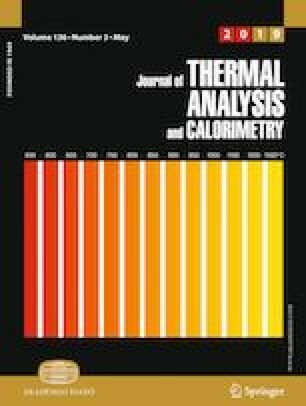 Thermal decomposition behavior and kinetics of aluminized polymer-bonded explosives (PBXs) based on l,3,5,7-tetranitro-1,3,5,7-tetrazocane (HMX) bonded by hydroxyl-terminated polybutadiene (HTPB) and aluminum powder were investigated. Different from the literature, aluminized PBXs have undergone three-steps decomposition measured by thermogravimetry which could be best distinguished by derivative thermogravimetric study. Results revealed that the thermal decomposition behavior has been significantly influenced in the presence of Al and HTPB matrix, especially reducing the thermal stability than that of neat HMX. The reactivity of aluminized PBXs has been rationalized on the basis of dependence of the effective activation energy upon conversion determined via the popular isoconversional methods and compared with peak temperature at maximum reaction rate method. Resulting activation energy dependence obtained for the first stage has been found to be 82.2–231.3 kJ mol−1 in the region of 0.05–0.25 for the slow pyrolysis, followed by a significant variation in the anomalous activation energy with conversion from 446.9 to 1282.8 kJ mol−1 in the region of 0.3–0.6 for the second-stage decomposition of aluminized PBXs. The above-mentioned values are in good agreement with those obtained from the Kissinger method. Thermodynamic parameters for the formation of the activated complex, and critical temperature and self-accelerating for thermal explosion were also determined. The authors express their thanks to Dr. Manjit Singh, Distinguished Scientist/Director, for his constant motivation, guidance and fruitful discussion. The authors are also thankful to TC Sharma and Mahesh Kumar for their kind support for providing thermal analytical facilities and recording some TG measurements.